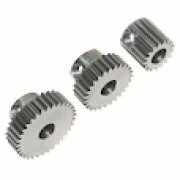 These are perfect for installing larger 550 can motors with 5mm shafts in your Traxxas Slash or other 10th scale vehicle that uses 48p spur gear teeth. Hardened 17 tooth 5mm Pinion 48 pitch. Has 5mm bore. Great for putting in a 5mm shaft motor into ..